This account of this story comes from Yoshitoshi's Strange Tales by John Stevenson, p. 76. While the print being described is different than the one in the Lyon Collection which is by Toyokuni III, the basic story remains the same. "This story is taken from the Kabuki play Hakone gongen katawa no adauchi (A Cripple's Revenge at Hakone Shrine). During the construction of Hushimi Castle, Sato Gōsuke killed his colleague Sanpei and stole his heirloom sword, named Hiryūmaru. Sanpei's brother Katsugorō and loyal retainer Fudesuke tried unsuccessfully to take revenge on Gōsuke. Gōsuke wanted to make Hatsuhana his concubine, but Hatsuhana loved Katsugorō. They married but were forced to flee from Gōsuke's jealousy. An accident to Katsugorō's knee crippled him and made him dependent on Hatsuhana. They arrived at Hakone Gongen, a shrine celebrated for cures on the eastern shore of Lake Ashinoko; prayers there were considered especially efficacious when offered by worshipers who proved their sincerity by standing under the chilling waters of the temple's waterfall. Gōsuke sends a message that he has captured Hatsuhana's mother but will let her go in return for Hatsuhana's favors. Hatsuhana pretends to submit, then resists and is killed defending her honor. 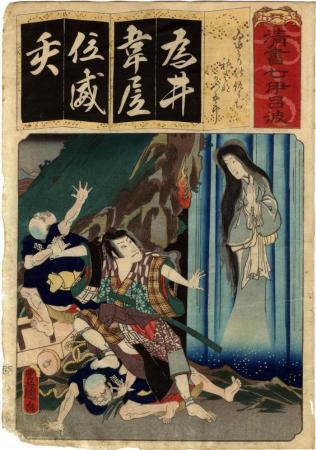 Her ghost appears to her mother and Katsugorō, who accuses her of infidelity. 'On the contrary,' says Hatsuhana, 'I have been praying for your recovery under the waterfall for ninety-nine days, and tomorrow is the hundredth.' At that moment Gōsuke's retainer approaches, intending to kill Katsugorō. Miraculously, the crippled Katsugorō stands and cuts down the retainer with his sword. Having witnessed Katsugorō's triumph, Hatsuhana's spirit vanishes. 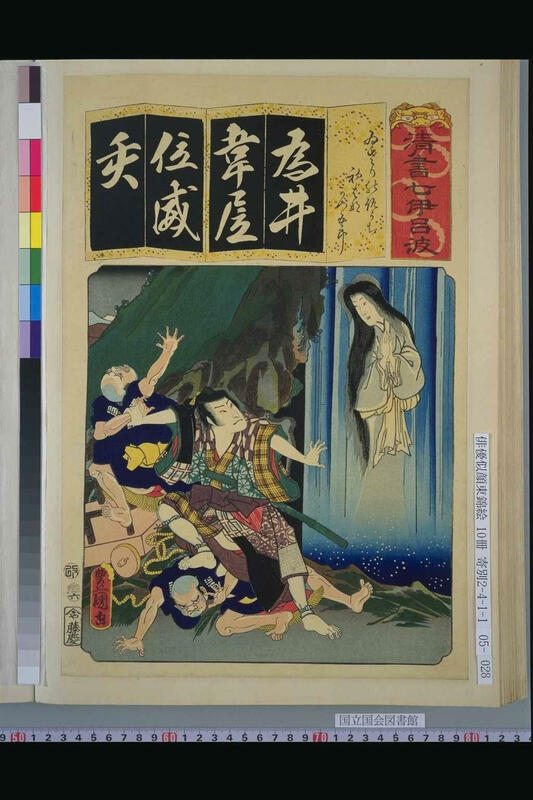 Fudesuke brings Hatsuhana's bloody head and tells the full story to her mother and Katsugorō, who sets off to kill Gōsuke."